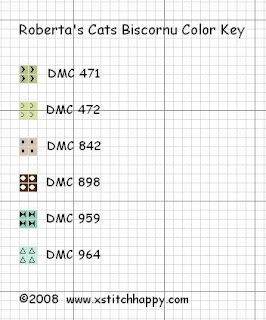 Here is a biscornu to match the Roberta's Cats Scissors Fob. A friend has requested one with bunnies so I will try to work on that one and one with dogs this week. They will use the same color scheme so they will also match the Roberta scissors. This design is soooo cute!!!! I love the colors you picked for it, too!! Thank you so much for sharing!! This is adorable! Can't wait to see the dog and bunnie ones:) Thank you for the wonderful freebies!! Thank you! Love the little kitties! Thank you SO much for putting this up! I loved stitching it, and my aunt LOVED getting it! I really appreciate all the patterns you've placed on your blog! Thanks, the grille is very nice. I loved stitching this pattern! I did make one change though - I stitched the cats with an orange variegated floss to represent our orange tabby cats. Thank you for sharing. I really love your patterns! I stitched this design, using orange variegated floss for the kitties to match our two orange tabbies - HopSing & HeyBoy. We recently lost HopSing, so that makes this even more special. I love how it turned out.